I was always drawn to Duke Ellington, I think because any photo I came across of him he had a huge, wide smile on his face, and he looked like a fun guy to be around, let alone listen to, at the jazz clubs. His charisma got me from the get-go. Duke Ellington also made me wonder if he was the “golden age” of jazz, what with the photos of him in top hat and black tie, his orchestra’s appearances at the Cotton Club in New York City, which are now legendary. Going to a sophisticated joint to quaff a cocktail or two and listen to jazz in the big city is what Duke Ellington symbolized to me. 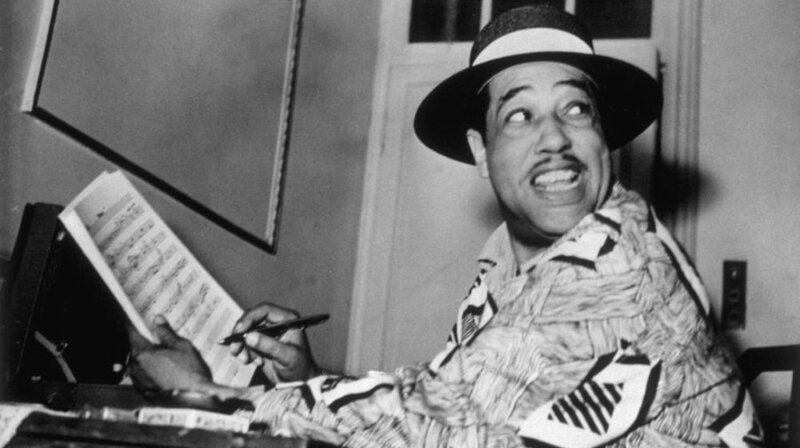 Duke Ellington is credited for elevating jazz as an art form, thought “beyond category” and considered his music part of American music in general, not too specific to jazz. Duke is responsible for creating the best jazz orchestra ever, and many members stayed on for decades. He wrote many little gems to fit the three-minute 78 rpm format available in the day. He composed over a thousand works, many which are now standards, such as “It Don’t Mean a Thing (If It Ain’t Got That Swing”), “Black and Tan Fantasy”, “Take the ‘A’ Train”, and “Mood Indigo”. I love that his mother, Daisy, ensured her son spent time with refined women to learn proper manners and how to live elegantly. He had a relaxed, easy manner, a sense of grace, and was always a dapper dresser, which earned him the nickname “Duke” from a childhood friend. He got on well with his orchestra players, conducting from the piano (just like Hadyn and Mozart), and using his charm, sense of humour, and flattery to achieve the musical results he wanted. Duke Ellington and his Cotton Club band performing “Old Man Blues” – the footage gives you good idea of the nightlight at that time. Edward Kennedy”Duke” Ellington, was born April 29, 1899 in Washington DC, and died May 24, 1974 in New York City.